Home » car » Dutch Lady » Food n Beverage » Giant » offline contest » Perodua » purchase » qna » sms » spend » vouchers » Dutch Lady Buy, Save & Win Contest: Prizes worth RM120,000 to be won! Dutch Lady Buy, Save & Win Contest: Prizes worth RM120,000 to be won! 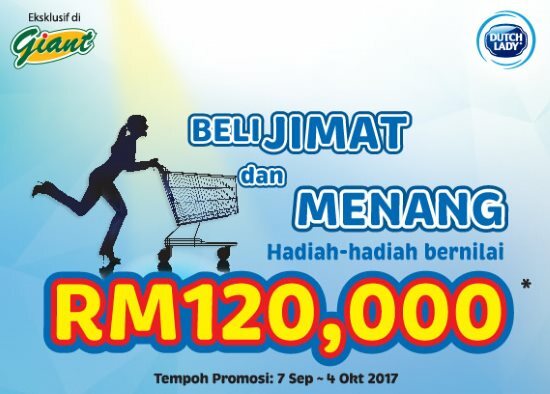 Weekly Prize x 200 winners: RM100.00 Giant voucher each. Buy any Participating Dutch Lady branded products worth RM30 in a single receipt at any participating Giant outlet during the Contest Period. Answer a question: “The Contest Grand Prize is a Perodua Alza. True/False”. Visit Dutch Lady Buy, Save & Win Contest terms & conditions for more details.